Regulators, retailers ask: What's fair? MIAMI BEACH, Fla. -- "Is it fair for you to get to us through the lenders?" That was the question Detroit-area dealer Bill Perkins put to Patrice Ficklin, the Consumer Financial Protection Bureau's assistant director for fair lending and equal opportunity, during a Q&A session at the annual conference of the National Association of Minority Automobile Dealers here. The July 8 exchange came as a CFPB official addressed dealers directly in public for the first time. The agency, which by law has oversight over lenders but not dealers, has sent officials to lender conferences -- but not to dealer gatherings. If Ficklin -- joined by Steven Rosenbaum, chief of the housing and civil enforcement section of the Department of Justice's Civil Rights Division -- thought the reaction from the mostly minority audience would be warm and fuzzy, that wasn't the case. But Ficklin stood her ground, even when Perkins pointed out the added workload of proving to his lenders that his two Chevrolet stores are in compliance with the agency's regulations. "I am not trying to get to you," she said. "But I would ask you, would it be fair for me to turn my head from the discriminatory outcomes of lenders' policies? Part of my obligation is to enforce the Equal Credit Opportunity Act. "It sounds like you are asking me to turn my head on that for fear of potentially reaching you all as a business partner of these lenders. I can't do that. I have to meet my responsibilities." Several dealers from the nearly packed room questioned the regulators about what procedures might be considered discriminatory. Perkins: "You all feel like discrimination is going on in the marketplace?" Perkins: "Well, all dealers do not discriminate." Perkins: "But we're all being painted with the same brush because of the policies and procedures you all are putting into place." Ficklin: "It's hard for me to see increased fair-lending compliance for lenders as a bad thing. It sounds like a bad thing when Ally visits you guys and engages in that type of compliance." Perkins: "I didn't mean it was bad. If you think they're coming in because I'm out of compliance, you're wrong." Ficklin: "I didn't say that and I wouldn't say that." In her opening remarks, Ficklin said it was important to remind folks that the CFPB has consistently stated that dealers deserve to be compensated for the work that they do. "We have not forbidden dealer reserve," she said. Dealer reserve is the amount of discretionary interest, usually capped at 2 or 3 percentage points, that a lender allows a dealership to add to the wholesale rate on an auto loan as the store's fee for arranging the loan. The CFPB has said that giving dealers discretion in auto-loan rates through dealer reserve can open the door to discrimination, even if inadvertent, resulting in minorities paying higher interest rates than other consumers. "Instead, what the bureau has recommended is that banks and captives and other indirect auto lenders take steps to ensure they are operating in compliance with the Equal Credit Opportunity Act, whether they maintain discretionary policies or not," Ficklin said. 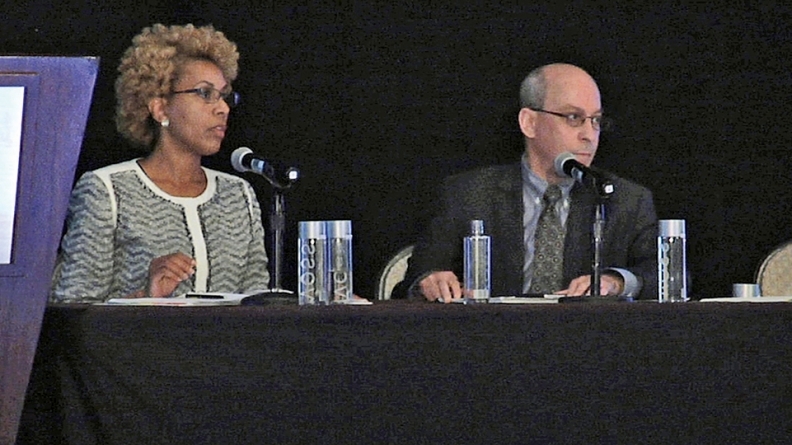 While the agency has cited flat fees as one way of reducing the risk of discrimination, Ficklin stressed that flat fees aren't the only way auto lenders can pay dealers for arranging loans. "There could be a variety of possible alternatives," she said. She and Rosenbaum said borrowers typically don't understand they can negotiate the difference between the buy rate and the final rate. Rosenbaum said minority buyers often end up on the short end of the stick because "discretion is not being managed." He questioned what direction is being given to F&I professionals and whether dealers have policies about when to mark the buy rate up or down and terms of negotiation. He also asked them to consider how they train employees on policies and if they monitor the results. "That's the basic idea behind having a compliance management system," Rosenbaum said. He said a third method of compensating dealers for arranging loans would allow for a markup that would be much lower than the typical markup of 200 to 250 basis points. Rosenbaum said the lower cap structure still allows for discretion but would reduce or eliminate disparities between minority and nonminority borrowers. The lower-cap model, he said, also would allow the lender to have a lower cap, which could affect the individual borrower's contract rate, and a flat fee on top of that. "I can say with some confidence that the systems that we are describing can be executed in a way that don't affect individual dealer compensation," he said. Rosenbaum said the agency's only task is to "prevent and end discrimination in the credit market," adding that "there have been some bugaboos in the press that we're engaging in things other than ferreting out discrimination and addressing it. "We are not looking to take money away from dealers." Rosenbaum had opened his remarks by saying: "It's a pleasure to speak to an audience of people who we could potentially sue but we also have lots in common with. My remarks are: Here's what to do not to be sued by us."